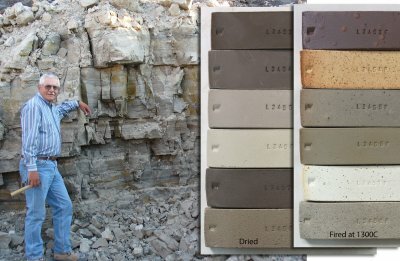 Clays that have been transported by water from the site of their primary alteration and settled into layers are called "sedimentary" (as opposed to "primary" clays which are found near the site of alteration). Sedimentary clays are classified according to the geological period in which they were formed. Nature purifies these clays mechanically, removing gravel and sand. But it also contaminates them chemically or at the ultimate particle level, adding iron and fluxes. Vast deposits of secondary clays can be found in many places and materials having a wide range of properties can layer right next to each other. Ball clays, earthenwares and stonewares are secondary clays. Plainsman extracts 6 different sedimentary clays from this quarry (Mel knows where the layers separate). The dried test bars on the right show them (top to bottom). The range of properties exhibited is astounding. The top-most layer is the most plastic and has the most iron concretion particles (used in our most speckled reduction bodies). The bottom one is the least plastic and most silty (the base for Ravenscrag Slip). The middle two are complete buff stonewares made by mother nature (e.g. M340 and H550). A2, the second one down, is a ball clay (similar to commercial products like OM#4, Bell). A2 is refractory and the base for Plainsman Fireclay. The second from the bottom fires the whitest and is the most refractory (it is the base for H441G). 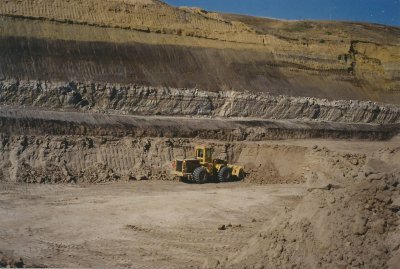 IXL Industries clay quarry near Ravenscrag, Saskatchewan in 1984. Layers of the Whitemud Formation are being mined. The layer being extracted is a silty stoneware they referred to as the "D member" (equivalent to Plainsman 3D which is mined several miles to the east). Below the D they continued to mine a much whiter kaolinized sand of equal or more thickness. Above the D is a ball clay (equivalent to Plainsman A2). Above that is a light burning stoneware (the combined layers that Plainsman extracts separately as A3 and 3B). A foot-thick layer of much harder volcanic ash is visible in the green over burden at the top. From these stoneware clays they made brick of exceptional quality, firing it as high as cone 10. Twenty years later the company reclaimed this land and today you would be unable to find where the quarry was located.